RM Sotheby’s top result at the Monterey 2017 auction was $22,550,000 for a 1956 Aston Martin DBR1 – the most-expensive British car ever. 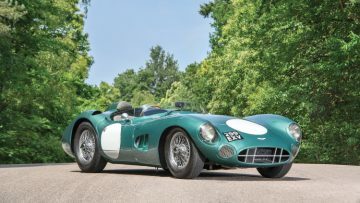 For the second consecutive year RM Sotheby’s set a new British car record at its Monterey 2017 auction when a 1956 Aston Martin DBR1 sold for $22,550,000. 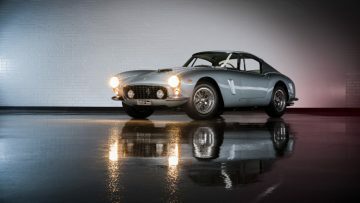 This top result earned RM Sotheby’s more than the next three cars together – a 1961 Ferrari 250 GT SWB Berlinetta, a 1959 Aston Martin DB4GT Prototype and a 1955 Ferrari 121 LM Spider. RM Sotheby’s Monterey 2017 sale achieved million-dollar-plus results on 32 cars including on 12 Ferrari produced between 1950 and 2015. 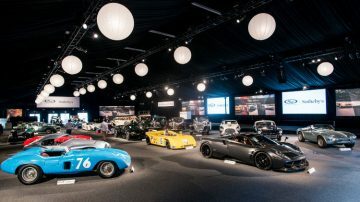 In 2017, RM Sotheby’s held its Monterey sale on 18 & 19 August 2017 at the Portola Hotel & Spa in Monterey, California, USA. 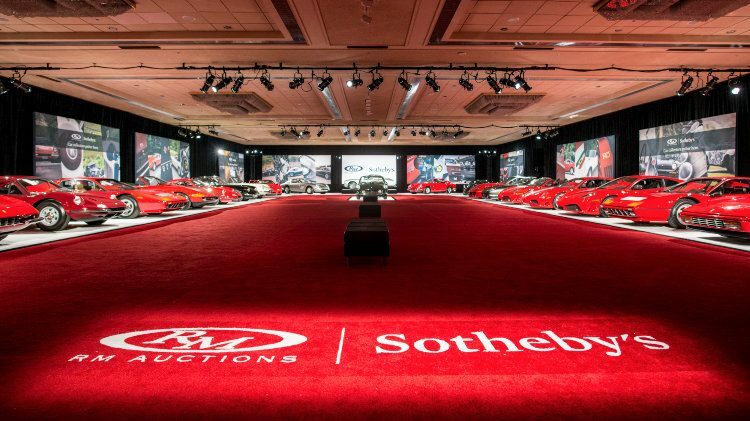 In contrast to Gooding and Bonhams, RM Sotheby’s increased its gains in 2017 with sales up 12% over 2016 for total earnings of $132,993,810 with a sell-through rate of 88%. 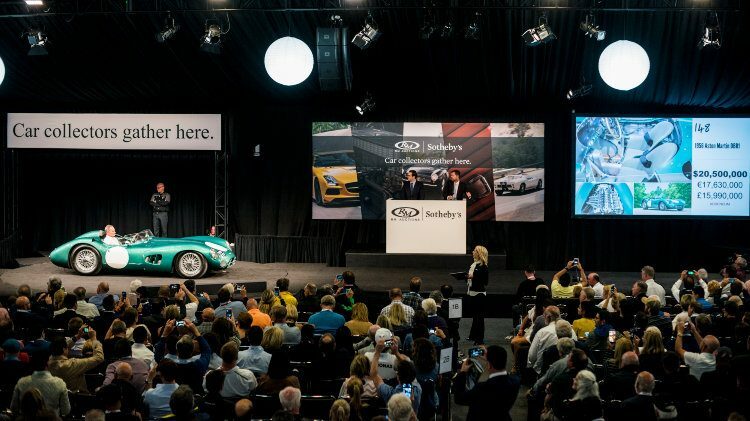 RM Sotheby’s sold 32 cars for over a million dollar. Based on first published results including auction premium. 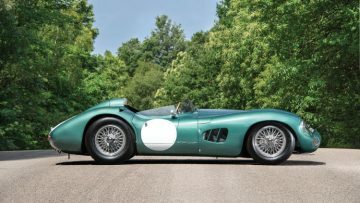 The 1956 Aston Martin DBR1, chassis DBR1/1, sold for $22,550,000 at the RM Sotheby’s Monterey 2017 sale as the most-expensive car at the Monterey Week 2017 auctions, the most-expensive car sold thus far in 2017, the most-expensive Aston Martin ever and the most-expensive British car ever sold at public auction. 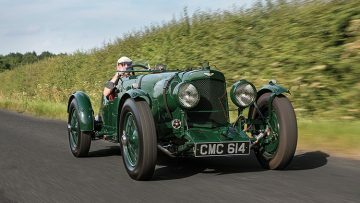 This Aston Martin is the seventh most-expensive car ever sold at public auction and only the eighth car ever to have achieved a result above $20 million. 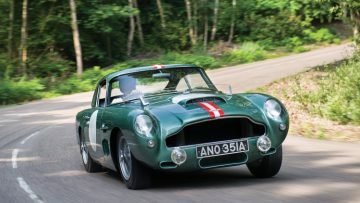 The previous record for the most-expensive British sold at public auction was set by the 1956 Le Mans-winning 1955 Jaguar D-Type that RM Sotheby’s sold for $21,780,000 at Monterey 2016 while the Aston Martin marque record increased from the $14,300,000 that was paid for a 1962 Aston Martin DB4 GT Zagato at the RM Sotheby’s 2015 New York sale. 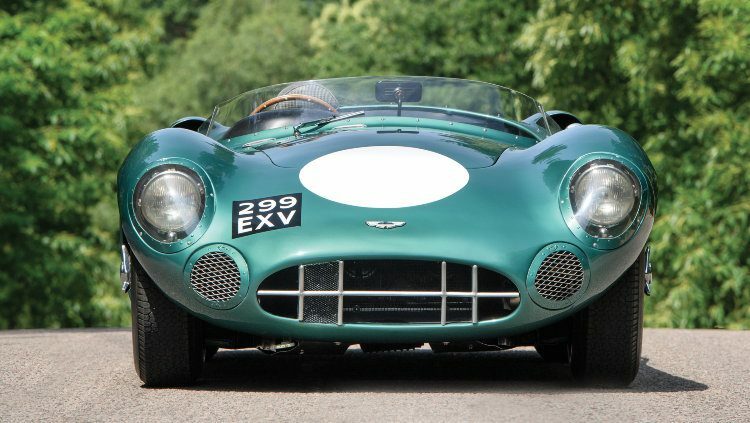 The 1956 Aston Martin DBR1/1 was the first of five DBR1 cars produced with the specific aim of winning Le Mans. 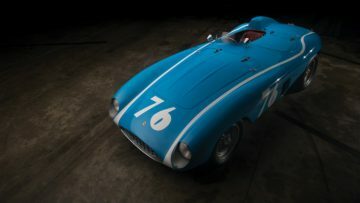 This car participated in Le Mans three times without success but a sister car, DBR1/2, won the 24 Hour race in 1959. The most important victory for DBR1/1 was first place at the 1959 Nürburgring 1000 KM with Stirling Moss behind the wheel. 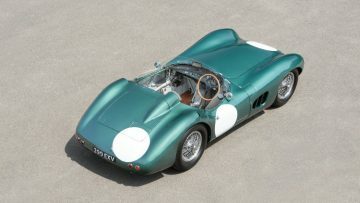 See 1959 Aston Martin DBR1 – the Most-Expensive British Car Ever for more on this exciting car. RM Sotheby’s second highest result at Monterey 2017 was for a 1961 Ferrari 250 GT SWB Berlinetta that achieved $8,305,000. Although this was slightly below expectations, and lower than bids refused for similar cars at recent auctions, the price paid was not too unreasonable given current market conditions and the risk the owner took in offering the car without reserve. This 1961 Ferrari 250 GT SWB Berlinetta is in concours restored condition, Ferrari Classiche certified and a Cavallino Classic 2016 Platinum award winner. The 1959 Aston Martin DB4GT Prototype, chassis DP199/1, sold for a strong $6,765,000. This car was the design project for the 75 DB4GTs and 20 Zagatos that would be built. It won at its first outing at Silverstone with Stirling Moss and Reg Parnell behind the wheel. It was raced at Le Mans in 1959 by the Ecurie Trois Chevrons team but the engine ran a bearing after only 21 laps. Until the 1956 Aston Martin DBR1 set the new marque record, a DB4 GT Zagato was the most expensive Aston Martin at just over $14 million. A regular non-Zagato DB4GT should sell for below $4 million. The 1955 Ferrari 121 LM Spider by Scaglietti sold for a new model-record $5,720,000 at RM Sotheby’s Monterey 2017, as the second most-expensive Ferrari in the sale. This racing car was the third of only four built. The 1955 Ferrari 121 LM Spider was raced as an official Scuderia Ferrari entry in both the 1955 Mille Miglia and 24 Hours of Le Mans races but retired from both events after around 10 hours. This Ferrari was more successful in shorter races in California under private ownership where it achieved many podium finishes. However, a crash in 1956 killed its driver, Ernie McAfee, the first fatality in SCCA racing. It led to the end of racing at Pebble Beach and the retirement of several drivers. The repaired car was rarely seen in the past two decades. 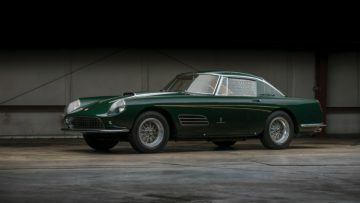 A 1959 Ferrari 410 Superamerica Series III Coupe achieved $5,335,000 at the RM Sotheby’s Monterey 2017 classic car auction to set a new model record. This rare car was the fourth of twelve Superamerica Series III cars built. The color and yellow side stripes are not original. In contrast to the racing and dual-purpose cars, these Superamericas offered near Ferrari racing performance but with finesse a world away from the racing circuit. 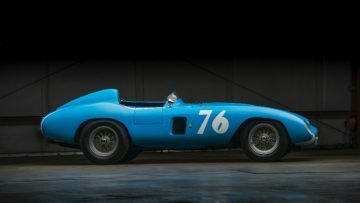 The 1950 Ferrari 166 MM/212 Export “Uovo” by Fontana sold just below estimate for $4,510,000. 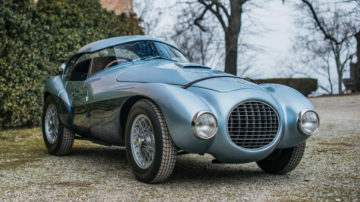 This car featured a unique egg-shaped body designed by sculptor Franco Reggiani for Count Giannino Marzotto who raced the car enthusiastically in Italy before selling it on to North America. Reliability let the Uovo down in several races – once while leading the Works Ferrari by 30 km. 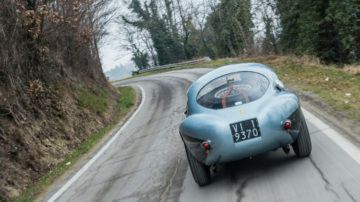 The Uovo participated in the Mille Miglia historico several times since 1986 – a race it was prepared for in 1953 but where the owner preferred to race a 340 MM Spider instead. Enticingly for the new owner, the Uovo has not been shown at major concourse events. A 1954 Ferrari 500/735 Mondial Spider sold for a model-record $3,850,000. This was the 12th of only 13 first series 500 Mondial Spiders with Pinin Farina coachwork but the engine was upgraded to a 735 version prior to delivery to Anthonz Parravano in California. Parravano raced it successfully but he disappeared without a trace while the IRS was searching him for taxation reasons. 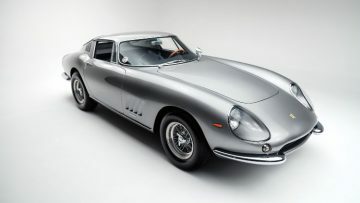 A 1965 Ferrari 275 GTB/6C Alloy by Scaglietti sold above estimate for $3,575,000 – the second best 275 result of the six that sold at the various Monterey Week auctions. 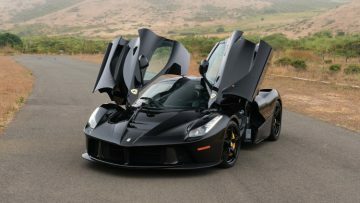 A black 2015 Ferrari LaFerrari sold for $3,410,000 – around $110,000 less than a similar yellow car achieved at Gooding. However, in contrast to the 200-mile car at Gooding, this LaFerrari was enjoyed by its owner over 4,000 miles. A 1967 Ferrari 275 GTB/4 sold for $3,025,000, a 1969 Ferrari 365 GTS sold for $2,722,500 and a 1952 Ferrari 342 America Cabriolet sold for $2,255,000. All results near expectations. A 1972 Ferrari 365 GTB/4 Daytona Spider that hasn’t been seen in public for two decades sold above estimate for $2,172,500. As did a 1991 Ferrari F40 that achieved $1,540,000 – the best F40 result in more than two years. The F40 at Bonhams had a similar result well above expectations. A 1970 Porsche 908/03 sold for $3,575,000. 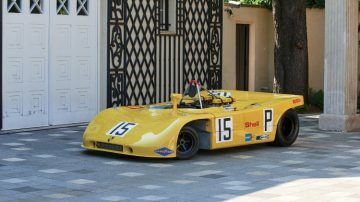 This car was used mostly for development purposes but the car finished second overall at the 1970 Nürburgring 1000 KM in the only race it ever formally entered. The fully restored car won First in Class at the 2017 Masterpiece Concours d’Elegance at Schloss Dyck in Germany. A 2015 Porsche 918 Spyder sold for a well above estimate $1,842,500 to set a new model record. This 918 was the 89th of 918 built and one of the first of 294 delivered to the USA. A 1951 Porsche 356 1500 Coupe by Reuter similarly exceed expectations by selling for $1,017,500 – $300,000 above upper estimate. It set a new model record for a Pre A 356. The 1930 Bentley 6 ½-litre Speed Six Sportsman’s Saloon with coachwork by Corsica was the best Bentley result in two years when it sold for $3,410,000 at the RM Sotheby’s Monterey 2017 auction. The car benefited from Bentley’s Le Mans successes to offer both speed and reliability, as well as comfort with its impressive Corsica body. This car is one of the best-known Speed Sixes with a known ownership history from new. It is well known in classic car circles. With the 1928 Mercedes Benz 26/120/180 Type S Sports failing to sell, the top Mercedes Benz result at RM Sotheby’s Monterey 2017 was $2,585,000 achieved on a 1937 Mercedes Benz 540 K Sports Cabriolet A. 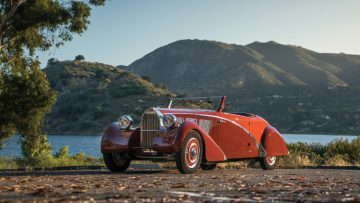 Despite winning Best of Show at the 2015 Arizona Concours d’Elegance and third in class at Pebble Beach 2014, this Cabriolet A, which is almost as elegant as the Special Roadsters, failed to sell at two previous auctions. At the RM Arizona 2015 auction the estimate was a higher $3.4 to 4 million while it was also offered by Bonhams at Greenwich in 2016. The bulkier 1936 Mercedes-Benz 500 K Offener Tourenwagen by Sindelfingen achieved $1,540,000. This large Mercedes is one of only four known survivors of the 16 produced. It has been in single-family ownership for over six decades. The car was a class award winner at the 2015 Pebble Beach Concours d’Elegance to confirm the quality of its restoration. It also took best of show at the Forest Grove Concours d’Elegance in 2015. Mercedes Benz 300 SL Gullwing and Roadster prices have been weaker over the past two years than they were in 2014 and 2015. Several cars sold for below a million dollar or failed to clear reserve margins. Bonhams struggled with a Gullwing and a Roadster at Quail Lodge but Gooding had strong results with two of each at Pebble Beach. 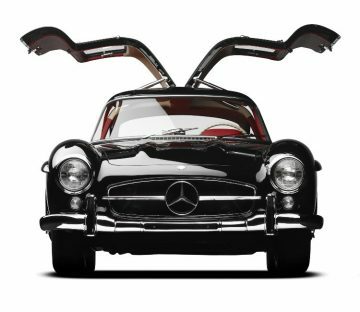 The 1957 Mercedes Benz 300 SL Gullwing sold for a strong $1,485,000. Nearly $700,000 was spent recently on the complete restoration of the car. Nevertheless, the car still has its original engine, drivetrain, gearbox and belly pans. 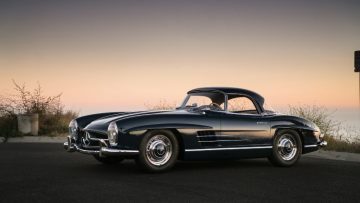 The 1960 Mercedes Benz 300 SL Roadster sold for $1,375,000 – amongst the best results in the past two years. This car is in an immaculate restored condition and finished in medium blue with a factory correct hardtop and blue soft-top over beige. A 1935 Aston Martin Ulster Competition Sports sold for $2,172,500 – the third over a million-dollar result for an Aston Martin at RM Sotheby’s Monterey 2017. This car has been raced all over the world and may be the most-raced car ever. It participated in the 1935 Mille Miglia (DNF) and finished 8th overall at the 1935 Le Mans 24 Hours. Since then, it has received around 650 awards in 40 years of racing. Two modern Aston Martins sold for $616,000 each: the 1989 Aston Martin AMR1 Group C and the 2006 Aston Martin DBR9. The latter result set a new model record at more than double pre-auction estimate. 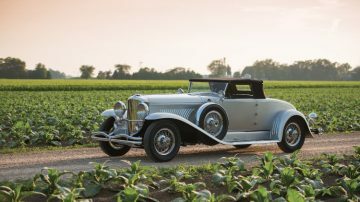 As expected, the 1929 Duesenberg Model J Convertible Coupe by Murphy performed best with a $1,430,000 result. An unmolested, single-family 1964 Shelby 289 ‘Lindauer’ Cobra sold for $1,100,000. A 1953 Cunningham C-3 Coupe by Vignale was a surprise million-dollar car when it sold for $1,100,000. 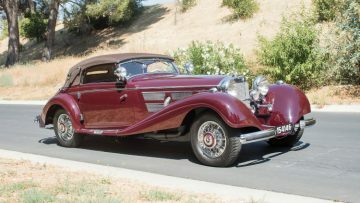 Similarly, a 1936 Auburn Eight Supercharged Speedster sold for $1,017,500 – well above estimate. The 1925 Bugatti Type 35C Grand Prix sold for $1,155,000, as the top Bugatti result at the RM Sotheby’s Monterey 2017 auction. This car is one of at least four produced with the same chassis 4572 number. (For tax purposes most likely, as all four were owned by the legendry Elizabeth Junek.) The early history is thus uncertain but the car has been in California for the past six decades where it was frequently campaigned in historic races. A Bugatti 35 GP sculpture by Francosi Chevalier, 2016, sold for a good $66,700. The Type 35 was the winningest racing automobile of all time with at least a thousand victories between 1924 and 1931. At the peak of its career, Type 35 averaged 14 victories per month. The 1937 Bugatti 57 Cabriolet, chassis 57156, sold for a disappointing $572,000 – almost half the estimate $1,200,00 – $1,500,000. Although this car has a rather questionable and uncertain early history, the buyer certainly got a bargain. 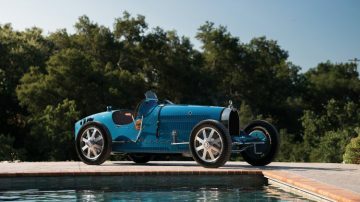 This Bugatti was originally sold to Belgian racing driver Trasenster but later sold again by Bugatti with a new chassis on the same number and a new engine. 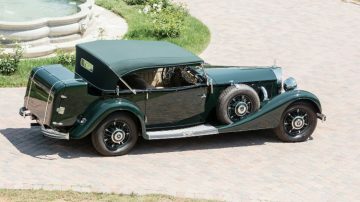 Sometimes during the period the D’Ieteren drophead coupe body was fitted on the second chassis. The restored car has been shown at various events including Amelia Island and won Best of Show Pre-war in the 2013 La Jolla Concours. 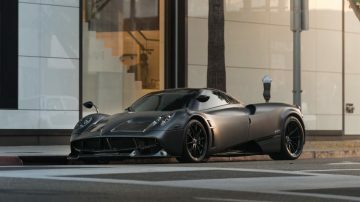 A 2014 Pagani Huayra Tempesta sold for a model-record $2,420,000. Only 100 of these cars were ever produced with the first US-delivery car. It is the only Huayra Tempesta finished in Grigio Scuro Opaco. It is also fitted with the €180,000 Tempesta performance package. The car also comes with a seven-piece luggage set that was a $20,000 option – presumable unused as the car has covered only 640 miles since new. 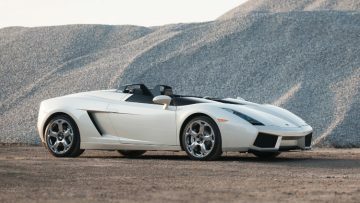 The 2006 Lamborghini Concept S sold for $1,320,000 – well below estimate. This Lamborghini was the first and only functional example of a planned run of 100 that was actually built. It is street legal but has only been driven 180 miles on its own propulsion (but has been displayed all over the world). It previously failed to sell at the RM Sotheby’s New York 2015 auction when the estimate was a higher $2,400,000 – $3,000,000. A 1976 Lamborghini Countach LP 400 Periscopio became the latest Countach to sell for over a million dollar when it achieved $1,034,000. 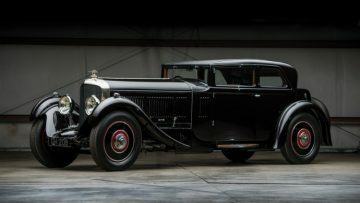 As at Gooding Pebble Beach 2017, the top car failing to sell at the RM Sotheby’s Monterey 2017 auction was a 1928 Mercedes Benz Type S 26/120/180 S Sport Tourer with body by Sindelfingen. 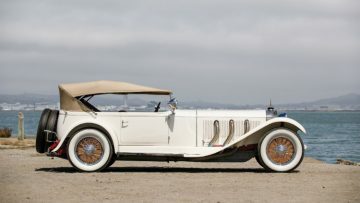 The Mercedes at Gooding was fitted with the sportier Gläser coachwork and attracted a highest bid of $4 million. RM Sotheby’s next two auctions will be London on 6 September and the much-anticipated Ferrari Leggenda e Passione sale in Maranello on 9 September 2017.